Masterbolt Travel Door Lock is a simple two-piece mechanism that when properly deployed, renders it extremely difficult to open a door from the outside, even when in possession of the keys. 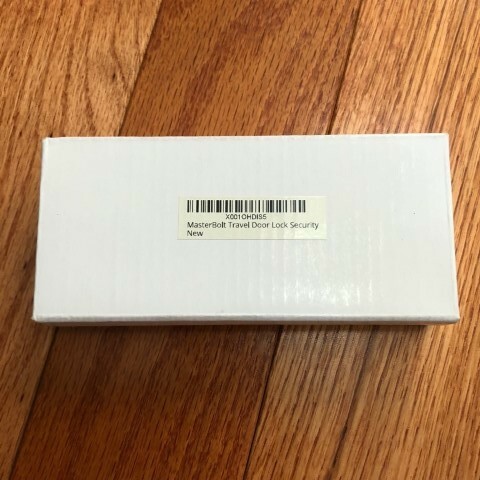 The Masterbolt lock arrived in a simple white cardboard box. It’s refreshing to receive something that is not over packaged. The design is elegant, simple and fiercely effective – two pieces, chained together is all that’s needed. After practicing a few times, it literally takes seconds to deploy and remove. First, the long metal part’s tabs are placed into the strike plate on the door frame. The door is closed and the latch bolt protrudes through the hole in the Masterbolt plate. On the knob side of the plate, the sliding bolt on the red part is placed into the triangular hole in the metal plate. 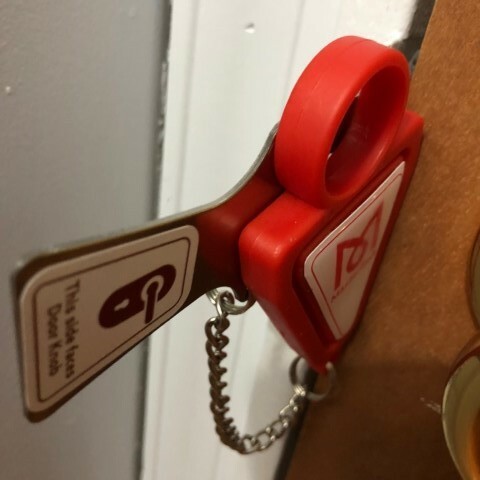 The edge of the red part rests against the door. That’s it – secure. Once the Masterbolt is installed, the door is VERY securely locked, whether the door is locked using the knob or not. I tried, hard, to dislodge the Masterbolt. If the strike plate is properly anchored, only an extreme amount of force is going to breach that door. Pulling on the doorknob in an attempt to open the door resulted in flexing and distortion of the entire door frame. The stronger the door and frame, the better the Masterbolt is going to work. I’m confident that nothing short of a sledgehammer, SWAT breaching tool, reciprocating saw, or vicious kick by a mule is going to get that door open. Masterbolt’s Travel door lock is one of those “I wish I had thought of that” products. It’s tough and, in my opinion, works better than described. I was genuinely shocked at the stability and security this lock provides. 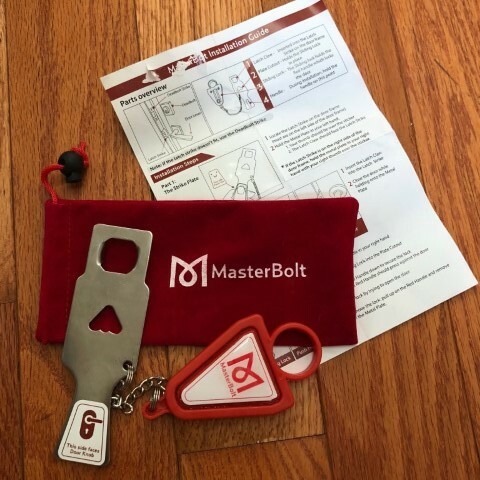 Gone are my days of frequent travel, but I’ll be using the Masterbolt Lock every time I will be sleeping in an unfamiliar location. Source: The sample for this review was provided by Masterbolt. But, -how- does it work? And would it work for doors that open outward or inward? Some Amazon reviewers say it won’t fit all doors, yet, I’m interested. Scroll down to “See Addalock in Action”. Nice idea and small enough to just put in a pocket in a suitcase and forget about it until it is needed. Thanks for the link. 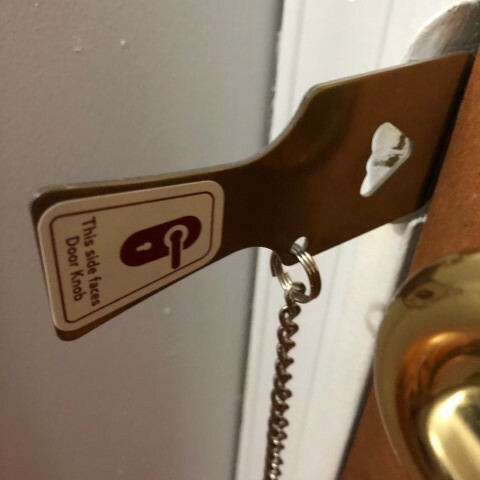 I ordered a different design because I’d mainly use it in hotels and don’t recall a majority of hotel doors with latch bolts as small as the hole in the Masterbolt style. We’ll see if this works, or I may get a Masterbolt and carry both. I am perplexed as to how this is supposed to work. The description is rather incomprehensible and uses odd wording. Quote: “the long metal part’s tabs are placed into the strike plate”. There are no tabs visible in the picture and the metal part is clearly placed onto and not into the strike plate. Quote:”The door is closed and the latch bolt protrudes through the hole in the Masterbolt plate.” I have really no idea what this means. Where does thoi sbolt come from. You need tools to work on bolts, right? The fact that there is no information to find on this device, not even on the included amazon link makes it even stranger. Whatś going on? The top picture shows the metal tabs, but they are under the plate, and causing it to sit up off the surface slightly. The sides of the top hole have indentions and folded sides, where the top and bottom are flush-cut. 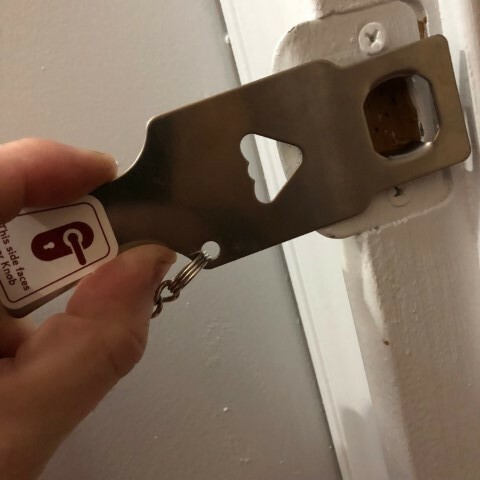 These two pieces are the tabs that go into the regular hole in the door jamb where the lock piece (remember, it’s called a “Bolt”, even though it’s not a bolt like a screw) clicks home to securely latch the door closed. 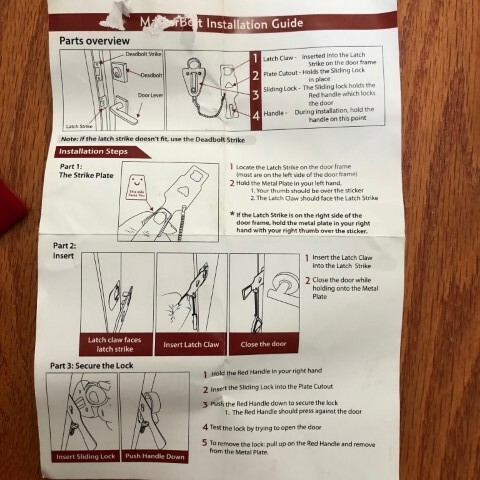 This traps the metal piece into the small crack between the door and door jamb, and the bolt has gone through that hole and into the place it usually goes – the door jamb. 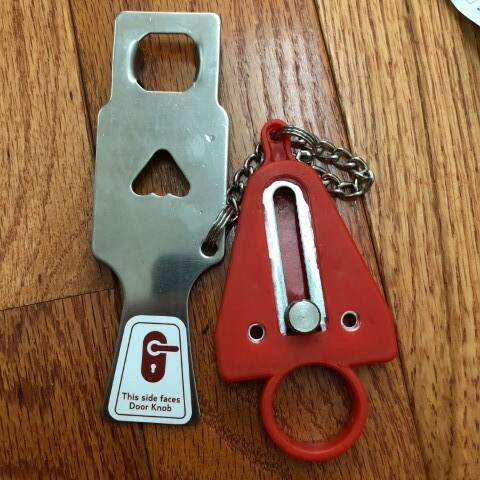 Placing the round knob that is shown on the back of the red piece in the first photo into the triangular hole also shown on the sinver piece of that same first photo creates a wedge that prevents the door from being pushed in. The entire door jamb or door locking mechanism must fail before the door will open.